ion. Such ions are readily resolved by high-energy mass spectrometry and are subsequently identified by characteristic energy loss mechanisms in a gas-ion detection cell. Using this approach, AMS can be used to quantify attomoles (i.e., 10-18 moles) of 14C in samples of size <1 mg at a precision of better than 1%. No other analytical method is capable of achieving this sensitivity or precision for 14C. Recent AMS analyses at CAMS have demonstrated that precise 14C measurements can be determined from relatively small (<1 mg) samples of bacterial cultures. These cultures were from archived collections dating back to the 1950s. They clearly showed the incorporation of "bomb 14C" and yielded radiocarbon contents that were consistent with the age of their production. In addition to the possibility of identifying culture dates, isotopic 14C signatures may make it possible to discern whether bacteria in question are not from the same culture. For example, bacteria grown on the same carbon media will contain identical 14C concentrations. However, bacteria grown on media that were produced at different times would have their own distinctive 14C content. With this approach it may be possible to discriminate the sources of otherwise genetically identical organisms by their 14C signatures. The AFM results shown in Figure 13.16a are from Bacillus globigii spores which we grew ourselves, and were not processed in any way beyond being washed three times with distilled water. The image on the right in Figure 13.16a is a low-resolution (1.6 |lm X 1.6 |lm) AFM image of a single B. globigii spore dried onto a mica substrate. Note that to its left, at high resolution (450 nm X 450 nm), we are able to determine the presence of rods of proteins, with a periodicity of ~8 nm. Our findings of this structure are the first to be reported for Bacillus spores,68 but the structures have been observed and termed "rodlets" on fungal spores.69,70 Although AFM is a relatively new technique in forensic investigation, it promises to provide important information on molecules adhering to spores and on modification to the exosporium caused by mechanical and chemical treatments during weaponization processes. We have also applied these methods to several samples of weaponized surrogate Bacillus spores from external sources and have included here the results of our analyses of one of those weaponized samples. A summary of the results can be seen in Figures 13.16b-g. A cursory characterization indicates that the sample was in powdered form, appeared tan in color, and was composed of fine particles; the spores were Bacillus globigii which had originally been grown in G media. Their viability was determined using a standard method of dilution to be 2.1 X 1011 CFU/gm. Heat shocking the spores prior to growth resulted in an approximate one order-of-magnitude increase in measured viability. observed. While the spores themselves appeared relatively clean (Fig. 13.16b), we observed what we believe to be clumps of silica mixed in with the spores. The EDX spectra confirmed the presence of silica in the sample. EDX analysis provided a good measure of the low Z elements—carbon through calcium. In this sample, carbon, nitrogen, oxygen, sodium, magnesium, aluminum, phosphorus, sulfur, potassium, and calcium were also identified, as shown in the representative spectra in Figure 13.16b. We attempted to quantify the amounts of elements with EDX but found that the nonplanar shapes of our sample created difficulty for the existing system. 10-15gm) quantities of several elements including silica, phosphorus, sulfur, chlorine, potassium, calcium, manganese, iron, and zinc (Fig. 13.16c). It should be noted that these PIXE results corroborate the EDX's finding of silica, phosphorus, sulfur, potassium, and calcium while also determining the presence of additional elements. Interestingly, PIXE results of the bulk sample revealed the presence of titanium (data not shown), a finding for which we have not yet determined a correlation in sample growth or processing. Bioaerosol mass spectrometry results (see Fig. 13.16d) of the powdered sample yielded identification of the particles as Bacillus spores, and we were able to correlate the mass spectra with a method of processing. It is important to realize that the mass spectral signature of an agent particle will reflect both the intrinsic biological agent and the matrix material in which it is embedded or coated. Therefore, the data generated by this instrument contain weaponiza-tion signatures as well as organism identification. To analyze the sample by aerosol mass spectrometry, we aerosolized ~0.5 mg of the powder and introduced the particles into the instrument through a converging nozzle. BAMS results (see Fig. 13.16d, left bar) indicate a preponderance of Bacillus spores without the presence of chlorine in this powder sample. A second powder (second bar from the left) was shown to contain chlorine in addition to spores. In all, six samples were investigated and grouped by method of processing (e.g., method I, method II). BAMS was able to determine that those made by method I contained spores alone, while those manufactured by method II were found to be rich in chlorine as well (see rightmost bars in Fig. 13.16d). The significance of this is that a BAMS detector can clearly provide process related data that may be useful for attribution. In cases where a covert dissemination takes place, and samples of the bioagent may not be easily recoverable, the BAMS system might provide the only data. Results of surface analysis and depth profiling using time-of-flight secondary ion mass spectrometry are shown in Figure 13.16e. Powder was dusted onto either a beryllium or silicon wafer in order to provide a flat substrate for ion sputtering. The sample was sputtered using a 1 keV cesium ion beam and then imaged with a 25 keV gallium ion beam. As was the case with the BAMS system, the ToF-SIMS spectra also contained weaponization signatures. The difference is that, whereas the BAMS signature is for the entire particle, the ToF-SIMS signatures can be obtained as a function of depth through the sample. Chemical maps generated from the spore surface indicated the presence of sodium, potassium, and chlorine, as expected. Mass spectra of the surface molecular fragments show the presence of silica over and above the background from a silicon substrate, as well as negative ions generated from surface proteins (i.e., CNO-, CN-). (The negative ions resulting from proteins are also seen with the bioaerosol mass spectrometer, providing a corrob-oration of results.) A depth profile through the center of the spore shows a slightly increasing presence of sodium, potassium, and protein fragments (i.e., CNO-, CN-) as the center of the spore is reached, with a concomitant increase in calcium. An interesting finding using ToF-SIMS was the increasing amount of fluorine in the spore as the center was approached (Fig. 13.16e). Fluorine may have been naturally present in the water used to grow the initial bacterial sample.71 These ToF-SIMS results of elemental composition complement those of EDX and PIXE; again, there is overlap (i.e., oxygen, sodium, potassium, phosphorus, calcium, chlorine, silica), as well as unique findings (i.e., fluorine). It should be noted that this ToF-SIMS technique with its ~100-nm spot size allows identification of the spatial location of the element within the spore. 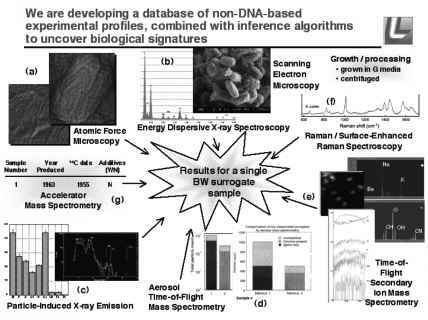 Raman spectroscopy from the sample produced spectra similar to those generated by nonweaponized Bacillus spores, again confirming that the Raman signal is due to the presence of calcium-dipicolinate in the spore (Fig. 13.16f). To analyze the powder, it was first dissolved into distilled water before drying a drop of the solution on a CaF2 puck for analysis. Without this water dissolution step, we found that the powder itself generated too much fluorescence and the particles were too convoluted to identify a single spore for analysis. Results discussed earlier of Raman and surface-enhanced Raman spectroscopy using nonweaponized spores (see the section in this chapter entitled "Raman and Surface-Enhanced Raman Spectroscopy") showed that SERS can distinguish between species of spores by probing the first few nanometers of the spore surface. This technique may prove to be an important tool for forensic analyses because of its high spatial resolution, good chemical selectivity, and high sensitivity. In order to determine the age of the powder, accelerator mass spectrome-try was applied to measure the 14C content of the sample, thereby determining a date based on the amount of that isotope present. As has been pointed out earlier (in the section describing Accelerator Mass Spectrometry), AMS analyses have demonstrated that precise 14C measurements can be determined from relatively small samples. These samples were taken from 1950s archives and showed the incorporation of nuclear testing-derived 14C, yielding dating results consistent with their production dates. For the specific powdered samples investigated here, less than 1 mg of the sample powder was combusted to graphite and analyzed by the 10 MeV accelerator mass spectrometer; the result for one such sample is shown in Figure 13.16g. The date arrived at by 14C analysis was 1955, in reasonable agreement with the actual date produced of 1963. The actual measurement of 14C in the sample is very accurate, but its interpretation is less so. The time resolution of 14C dating is ~1—2 years, and is somewhat less for more recent samples due to the flattening of the "bomb curve" which measures the 14C content of the atmosphere. In this case, the older 14C-derived date may indicate that the medium used to grow the sample was old or that there were other influences due to sample storage and handling later on. There are several factors which can change the ratio of 14C and influence a 14C-derived date. For example, the addition of fossil fuel carbon can lower the amount of 14C in a sample and make the sample appear "younger" than it actually is, while 14C contamination increases the 14C content and artificially "ages" the sample. Fractionation of carbon isotopes by bacteria is potentially another confounding factor, albeit less well understood for 14C than other isotopes. Clearly there is a need for methods to date the manufacture of BW agents that can be applied to very recent samples, and are independent of some of the possible artifacts that can influence 14C dating.